I traveled 8,401 miles, immersed myself in 500hrs of yoga therapy training, multiple specialized trainings to teach yoga in jails and institutions, took countless workshops that focused on restorative yoga, trauma yoga, yoga in recovery, yoga and psychology, ad infinitum. Yet I have experienced the training I did with UpRising Yoga to be the most informative, profound, inspiring, and life changing. It is because of UpRising Yoga that I even sought out my 500hr RYT certification. 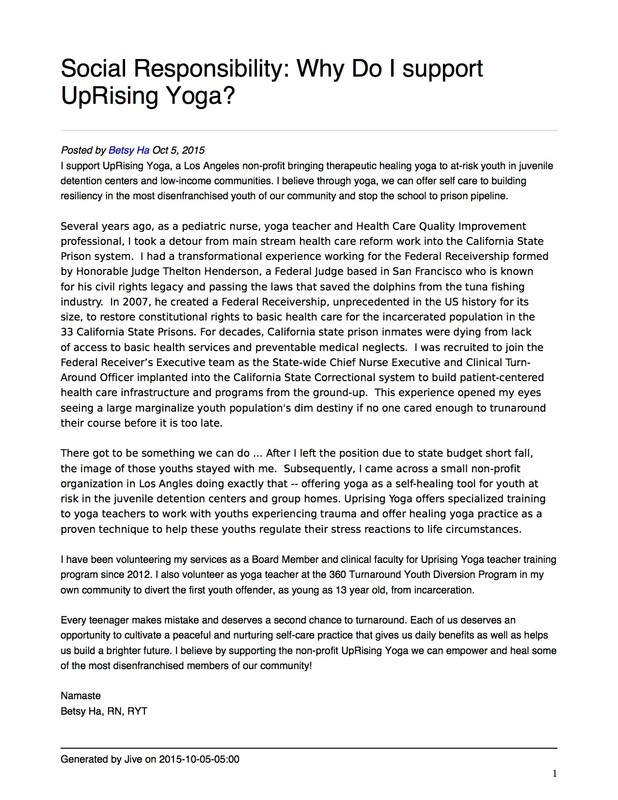 Their mission to “bring yoga to incarcerated youth and communities that need it most" is align with my own. And it was my exposure to incarcerated youth, as well as children with a history of foster care and commercial sexual exploitation (CSEC) in juvenile halls, detention facilities, and group homes that motivated a major career change. You don't have to be a yoga teacher to be informed, to get involved, to reach out and touch lives. I wasn't. UpRising Yoga's weekend training transformed my life and enabled me to transform the lives of others. Scholarships are available! Hi Jill, and the wonderful Uprising Yoga family! I was in your last round of trauma-informed training, and I wanted to let you know some great news....After months of maneuvering the hoops, I finally started my yoga group at the juvenile detention facility I work at here in Bakersfield!!! As far as I know, it's the first yoga class/group in a lockup facility here in Kern County! I have taught two classes so far, and I have them set up on a weekly basis. I have 9 young men in my class (it's an 8-week session) right now who have never practiced yoga. They show up every week eager and willing to learn, laugh, and try new things! I am grateful to you and the Uprising Yoga community for reminding me of the importance of this work, for giving me the courage and strength to continue to advocate for these valuable youth who need us, and for the constant reminder that I'm not in this alone!